Info "Swap panels to fix the picture!" Switch Back is a downloadable microgame in WarioWare: D.I.Y. and WarioWare: D.I.Y. Showcase. It was released on September 30, 2009 in Japan, August 30, 2010 in North America, and October 1, 2010 in Europe. 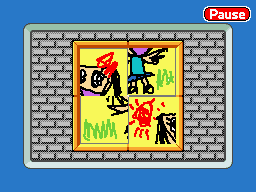 At the start of the game, the player will be shown a complete 2x2 panel swap puzzle of a Koala, guys doing exercises (likely a reference to Mario Paint), Super Mario Bros., or a kid-like painting of a little girl. Then the four pieces will be scrambled. The player is tasked to reassemble the pieces by swapping. This page was last edited on December 27, 2017, at 13:14.